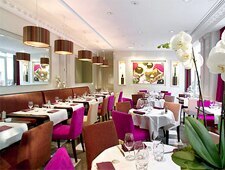 The plush restaurant of the Renaissance Paris Le Parc Trocadero. Breakfast & Lunch Mon.-Fri., Dinner Mon.-Sat., Brunch Sun. : Located in the Renaissance Paris Le Parc Trocadero hotel, where the hall, bar and courtyard have been totally refurbished, Le Relais du Parc comprises a terrace and a plush dining room. The stoves are now helmed by Stéphane Duchiron. After having worked with Guy Savoy, this chef previously presided over Les Fougères, a commendable restaurant in the 17th arrondissement. Expect French traditional fare, with sometimes exotic and original seasonings, such as lobster ravioli with green crab emulsion, spit-roasted sea bass with citrus and cardamom butter, and prune millefeuille with bourbon vanilla. The wine cellar is rich and the best bottles are, for the most part, served by the glass, or in carafes.